In all the bibliography or Carlo Carrà we may read the he was a futurist painter, as he signed their manifesto in 1909 along with other artists. However, he soon became disappointed by the movement and its possibilities. Tomasso Marinetti, the leader of the movement sent him to Paris for him to seek for inspiration and for renewing his energies for the Futurist Exhibition of 1912. Carrà meets several French artists and ends up fascinated by cubism. Therefore, he abandons the futurism and returns to his country, where he begins with a collaboration with Giorgio de Chirico, which later on is going to be known and metaphysical painting. The works produced as a result of this collaboration will have an dreamy atmosphere, juxtaposing objects, in direct relation with the unconscious mind. 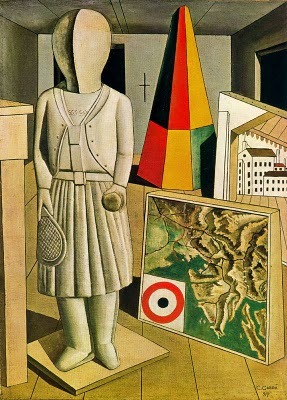 The metaphysical muse shows a mannequin with a tennis outfit inside a room next to other objects such as a map, a painting with buildings, a pyramid and a cross. Although the mannequin is a motif taken from the work of de Chirico, Carrà’s palette is darker and his works are less dramatic. Any interpretation of the painting would have less meaning than the painting itself, so I won’t even try to make one. Although the metaphysical painting hadn’t had any success beyond the 20s, it is now acknowledged as a precedent for the development of surrealism and dadaism. ~ by Álvaro Mazzino on March 18, 2011. This entry was posted on March 18, 2011 at 16:10 and is filed under Surrealism.You can follow any responses to this entry through the RSS 2.0 feed.You can leave a response, or trackback from your own site.